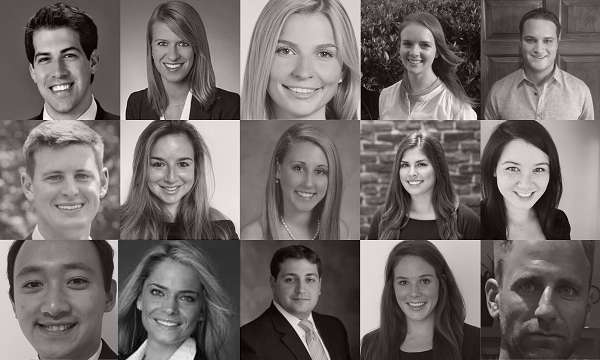 The Columbia Business School Real Estate Association (REA) is pleased to announce the assistant vice presidents elected for the 2017–18 academic year. The officers, all in the class of 2019, were elected by the REA membership. Alexis Crnkovich is a Chicago native who graduated from Vanderbilt University in 2013 with a Bachelor of Arts in Political Science and Spanish. Upon graduation, Alexis joined Deloitte Consulting’s Human Capital practice where she primarily served clients within the consumer and industrial products industries. Alexis specialized in M&A, leading clients through all aspects of this type of large-scale organizational change including operating model and organization redesign, employee training and readiness, communications and change management. After four years in consulting, Alexis is now a first-year student at Columbia Business School where she is pursuing a career in real estate development. J.C. Hay was a Vice President at JPMorgan’s Private Bank working with High Net Worth Individuals, Families, Endowments and Foundations where he oversaw $650MM in client assets. In his role there, J.C. advised clients on banking, credit, investments and wealth advisory. While advising his clients on their investments, J.C. became very interested in the real estate investments his clients were making. He decided to come to Columbia Business School to transition into real estate investment or development. J.C. is a CFA charter holder and a member of the Junior Committee of CaringKind. Kerry graduated Harvard University with a B.A. in Government. Prior to business school, Kerry worked as an Investment Associate at ASB Real Estate, a real estate investment management firm with approximately $7.3 billion assets under management. At ASB, Kerry covered the acquisition and asset management of retail, multifamily, office, and industrial assets across the United States, with a primary focus on New York City investments. Christian Coates worked as an Acquisitions and Structured Finance Associate at Federal Capital Partners, an opportunistic real estate private equity firm which owns and operates over $2.3 Billion in assets. At FCP, Christian was responsible for evaluating multifamily equity and debt investments in existing assets and new developments. Prior to joining FCP, Christian spent three years at Citigroup on their equity trading and fixed income sales desks. Christian is from Ocean City, MD and graduated from Harvard University with a Bachelor of Arts Degree in Government and a minor in Economics. Tricia is a California native and first-year student focusing on real estate investment and development. She graduated from the University of Southern California with a degree in Business Administration and a minor in French. After graduating, she consulted with CAST Management Consultants, specializing in operational efficiency for commercial banks, life insurers, and pharmaceutical companies. Tricia also worked in hotel operations while in college and is the AVP of Events for the Hospitality and Travel Association. Hayley Cox is a California Bay Area native and a first-year student at Columbia Business School. After graduating from the University of California, Santa Barbara, with highest honors, Hayley spent four years working for a private consulting firm focused in real estate development and urban and environmental planning, with clients ranging from cities and other local agencies to private real estate developers and REITs. Hayley has also been an active member of the Urban Land Institute, serving on two committees in the San Francisco District. Hayley is interested in real estate development and finance, and the intersection of real estate and technology. Michael Stern is currently a first year MBA candidate at Columbia Business School. Prior to Columbia, Michael worked as a Real Estate Private Equity Analyst at Morgan Stanley Real Estate Investing (MSREI). At MSREI, Michael focused on opportunistic and core investing opportunities across all property types where he closed over $460MM of real estate transactions. Michael assisted the Chief Operating Officer of MSREI in fundraising efforts for North Haven VIII Global, a $1.7Bn opportunistic closed end real estate private equity fund. In addition, Michael is a volunteer for the non-profit iMentor and is a councilmember of Cornell University’s College of Human Ecology Young Alumni Council. Michael received a Bachelor of Science with Distinction in Policy Analysis and Management from Cornell University. Amy Piccinich is a Vice President in the Global Real Estate group at JPMorgan Chase. On the Portfolio Management team, she leads retail redevelopment transactions for Chase branches across the country. She also underwrites strategic acquisitions and dispositions, and has spearheaded the valuation and analytics of the firm’s $17 billion corporate real estate portfolio. Prior to joining JPMorgan, Amy worked at both CBRE on the TIAA-CREF account and Boston Properties managing Class-A office buildings in New York City. Amy received a B.S. in Business & Economics from Lehigh University, and is currently enrolled in her second year in the Columbia Business School Executive MBA program with a focus on Real Estate and Finance. Sal Smeke is a member of the EMBA Global Class of 2019. He has been in real estate for the past fifteen years, and grew a portfolio from $70 to over $500 million dollars in value in only ten years. Sal repositioned assets to achieve a 2X valuation and exit in less than three years. He created and implemented a hotel brand in some of his New York Hotels which have been sold out since. Sal has vast expertise in multifamily, hospitality, deal underwriting and comes to business school with an extensive network of contacts who have worked with him throughout his professional career. Hanna Cassorla is a first year student at Columbia Business School pursuing a career in real estate development and investment. Prior to business school, she spent four years at Value Retail, a commercial real estate company focused on the development and operation of luxury outlet malls. As a Leasing Manager at Value Retail China, Hanna was involved in the opening of the newest and largest center in the VR portfolio, and was responsible for the creation and implementation of leasing systems for budgeting, financial analysis and deal approvals for two centers in Pudong and Suzhou. At Value Retail Management France, she was a Business Analyst for the property outside of Paris. Prior to Value Retail, Hanna spent two years at a New York-based boutique investment firm where she was responsible for due diligence and project management for third-party investment partnerships across alternative investment strategies including real estate, venture capital, natural resources, corporate credit and entertainment. She graduated in 2011 from Columbia University with a major in Political Science and a minor in Francophone Studies. Alex Cherner is from Bethesda, Maryland. He graduated from Washington University in St. Louis in 2014 with a BA in Psychology. After graduation, Alex joined AOL, Inc., where he worked in media strategy for two years. At AOL, Alex advised Fortune 500 companies on big picture strategies within the digital advertising landscape. Following AOL, he joined the venture capital arm of 1776, where he worked for one year before starting at Columbia Business School. At 1776, Alex worked closely with the CFO on the company’s operating financial model, in addition to sourcing deals and performing financial analysis on portfolio companies for the venture capital seed fund. Alex is a first-year student at Columbia focused on real estate investing, acquisitions and development. Elena Venkova graduated from the University of Cape Town in 2008 with a Business Finance Science Honors in Finance, Accounting and Economics and an additional Post Graduate Diploma in Accountancy in 2009. She qualified as a Chartered Accountant in 2012 after completing her articles at Investec Bank where she focused on corporate finance and treasury sales and structuring. In 2014 she joined Africa Property Partners as their Chief Operating Officer. Africa Property Partners, is a niche real estate company focusing on the real estate sector on points where government had failed the South African public such as student housing, mining housing and hospitals. Elena was responsible for investment decisions, financial analysis and everyday operations of the business. While under her management, the business tripled in size. Verity Sylvester is from Toronto, Canada. She graduated from the Richard Ivey School of Business with a BA in Business Administration in 2013. Most recently, Verity worked as a Senior Real Estate Analyst at Manulife Real Estate, an active owner, developer and manager of C$21.6B of commercial real estate worldwide. While at Manulife, Verity was responsible for evaluating and analyzing over 3 million square feet of office, residential, and industrial development opportunities across Canada. Prior to Manulife, Verity worked in retail leasing at Cadillac Fairview. Verity is a CFA Charterholder. Tommy Chan graduated from Cornell University with a B.S. in Civil Engineering in 2011 and a M.S. in Engineering Management from Northeastern University in 2012. Prior to business school, Tommy worked as a project manager at Pinck & Co., Inc., an Owner’s Representative firm located in Boston, providing development, design, and construction management services to public agencies, community development corporations, and higher-education institutions. He is experienced in pre-construction planning, schedule and budget development, cost estimating, and value engineering for ground-up and redevelopment projects. Tommy holds an Unrestricted Construction Supervisor’s License (CSL) in the State of Massachusetts. Robin Lore worked as a Manager of Corporate Initiatives at Bentall Kennedy, a North American real estate investment advisor with $36 billion of AUM. In this role, Robin worked with the corporate executive team on various strategic projects including the spinoff of a large client and the integration of a real estate team resulting from an acquisition. Prior to joining the corporate team, Robin was a Portfolio Analyst on Bentall Kennedy’s investment management team and focused on fund analysis, asset management and investor relations. Robin graduated from the University of British Columbia with a BCom in Finance and Real Estate. She is also a CFA Charterholder.